Create the dsp.FFT object and set its properties. ft = dsp.FFT returns a FFT object, ft, that computes the DFT of an N-D array. For column vectors or multidimensional arrays, the FFT object computes the DFT along the first dimension. If the input is a row vector, the FFT object computes a row of single-sample DFTs and issues a warning. ft = dsp.FFT(Name,Value) returns a FFT object with each specified property set to the specified value. Enclose each property name in single quotes. Unspecified properties have default values. Specify the implementation used for the FFT as one of Auto, Radix-2, or FFTW. When you set this property to Radix-2, the FFT length must be a power of two. Designate order of output channel elements relative to order of input elements. Set this property to true to output the frequency indices in bit-reversed order. The default is false, which corresponds to a linear ordering of frequency indices. Set this property to true if the output of the FFT should be divided by the FFT length. This option is useful when you want the output of the FFT to stay in the same amplitude range as its input. This is particularly useful when working with fixed-point data types. The default value of this property is false with no scaling. FFT length, specified as an integer greater than or equal to 2. The BitReversedOutput property is true. This property applies when you set the FFTLengthSource property to Property. Wrap input data when FFT length is shorter than input length. If this property is set to true, modulo-length data wrapping occurs before the FFT operation, given FFT length is shorter than the input length. If this property is set to false, truncation of the input data to the FFT length occurs before the FFT operation. Specify the output data type as one of Full precision, Same as input, Custom. y = ft(x) computes the DFT, y, of the input x along the first dimension of x.
Time-domain input signal, specified as a vector, matrix, or N-D array. When the FFTLengthSource property is set to 'Auto', the length of x along the first dimension must be a positive integer power of two. This length is also the FFT length. When the FFTLengthSource property is 'Property', the value you specify in FFTLength property must be a positive integer power of two. 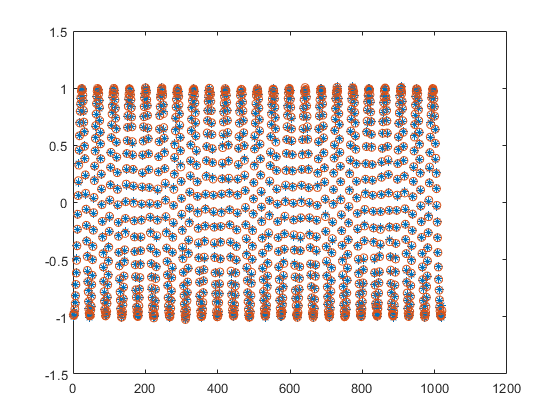 Discrete Fourier transform of input signal, returned as a vector, matrix, or an N-D array. When FFTLengthSource property is set to 'Auto', the FFT length is same as the number of rows in the input signal. When FFTLengthSource property is set to 'Property', the FFT length is specified through the FFTLength property. To support non-power-of-two transform lengths with variable-size data, set the FFTImplementation property to 'FFTW'. 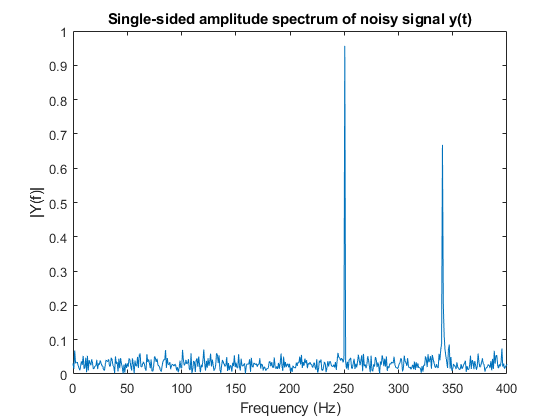 Find frequency components of a signal in additive noise. This object implements the algorithm, inputs, and outputs described on the FFT block reference page. The object properties correspond to the block parameters.